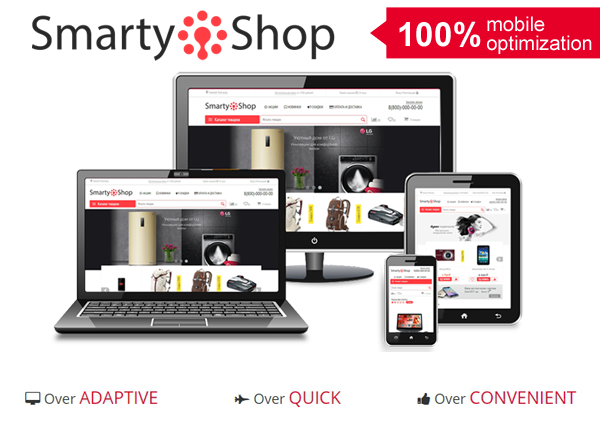 The theme of Smarty-Shop - adaptive & responsive design, maximum capacity. the Smarty Shop is the maximum opportunities for your business. to achieve success in product development, our experts have examined all the strengths and weaknesses of online stores. For this, we have analyzed more than 1 000 sites. The information obtained allowed us create a strong sales tool for your business! Modern web technologies. We use only the latest tools, thanks to them, your the store will look great and work on the computer and on the phone. cross-browser markup. Thanks to the use of crossbrowser layout, your online store will display correctly in all browsers, resolutions and devices. Selling structure. Using the method of trial and error based on experiments and expert analyses, we have developed a structure, which is suitable for selling virtually any goods via the Internet. This is a great generator sales! Thoughtful design. Studies have shown that users only need 50 MS to understand whether they like the website, they will stay on it or go to shop at another online store. It the decision affects the visual impression, so special attention was paid to the design. From the design of your online store affects your profit. 100/100 Users five times more likely to leave sites that are not optimized for mobile devices. Smarty-shop has a high rate of optimization for mobile devices, according to recent testing Google. 94/100 High-speed computers. For anybody not a secret that speed page load depends on the convenience of the visitor's interaction with Your online store. In developing the theme Smarty-Shop we gave this increased attention and has achieved high results. Autocomplete meta tags images of products and categories. If the ALT and TITLE you will use "page title", that is, the same name of the material, the search engine may consider the page is very optimized (as spam), which may lead to consequences. We have taken this into account, and set up filling the tags thus, to meet the requirements of search engines. Tags can be filled in by hand, the standard method, the processes not interfere with each other. Block "Product of the day". Want a new product does not remain without attention of visitors? Place it in a separate block on the main page, categories or any other sections. Change the color. Use the maximum capacity. Addon "Fixed cart block". If Your visitor adds a product to the cart at the bottom of the screen will be a fixed block with information about the number and value of items in your shopping cart. The buyer will be able to carry out various manipulations with the order not going in the basket. "Wide banner" Ask any color and banner will be displayed across the width of whatever screen is not visible online shop. Added 4 effects of the change. "Any code" - allows you to set up widgets, chat, write tags from the admin panel. "Consent to personal data processing" is an important aspect of compliance with Federal law. The ability to add to any form at will. "Button up" a flexible and configurable button scroll up. "Mobile menu" - flexible color and display settings. configure list views. You can easily define and configure how many items to place in the string. Comfortable navigation through product offers. You canbuild a theme Smarty-Shop for your business. To do this, we have developed 8 color schemes, each of which changes a visual representation of the direction of the online store. *ability to choose modules when you purchase a license. No need to think about installing themes. When you purchase themes Smarty-Shop, our experts will install it on Your current site.